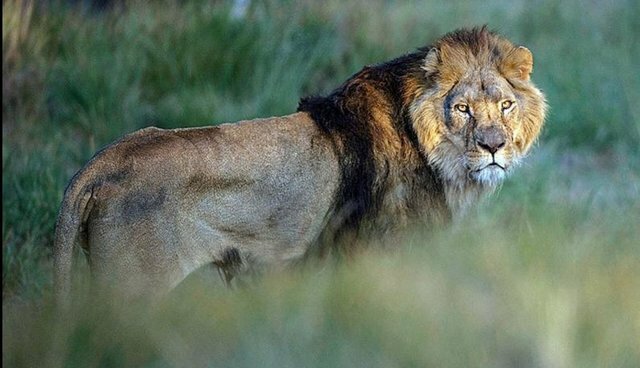 UPDATE: South African National Parks announced in a Facebook post Thursday that a lion has been darted and recaptured. Recent reports suggest the lion is Sylvester. He will be kept in the park "until a final decision is reached on his future." A 3-year-old lion named Sylvester may face death - all because he tried to wander far from home. Sylvester escaped from South Africa's Karoo National Park on Sunday. He managed to crawl under an electric fence after heavy rains had loosened the dirt, the BBC reports. This wasn't the first time he'd escaped. Last year, he was on the run for three weeks. After that incident, he was fitted with a tracking collar, which showed that this week, he had ventured about 12 miles from the park. According to AFP, he reportedly killed a cow. South Africa National Parks authority (SANParks) then announced that it would kill Sylvester once he was caught. That decision prompted swift internet outrage and launched the hashtag #SaveSylvester. SANParks has now walked back on its original statement, saying that putting him down is one of five current options. Other options include donating him to a private conservation entity or bringing him back to the park and improving the fencing. #SaveSylvester Why kill a lion for being a lion?? Stop this insanity. In the meantime, the #SaveSylvester hashtag is active - and people are urging the park to do the right thing. If you want to help save Sylvester, you can also sign a petition.